';Funny, moving. . . I defy anyone to finish this story without tears in their eyes. 'Graeme Simsion, bestselling author of The Rosie ProjectWhat would you do if you knew you only had 100 days left to live?For Lucio Battistini, it's a chance to spend the rest of his life the way he always should haveby making every moment count.Imperfect, unfaithful, but loveable Lucio has been thrown out of the ho… use by his wife and is sleeping at his father-in-law's bombolini bakery when he learns he has inoperable cancer. So begin the last hundred days of Lucio's life, as he attempts to right his wrongs, win back his wife (the love of his life and afterlife), and spend the next three months enjoying every moment with a zest he hasn't felt in years. 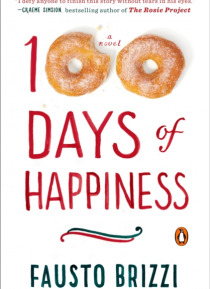 In 100 epigrammatic chaptersone for each of Lucio's remaining days on earth100 Days of Happiness is as delicious as a hot doughnut and a morning cappuccino.Wistful, touching, and often hilarious,100 Days of Happinessreminds us all to remember the preciousness of life and what matters most.